Now we also have a few benchmark tests to try and see what kind of performance the Snapdragon 615 chipset delivers. This might be Qualcomm’s mid-range offering, but the R7 has some great aspirations so it’s important that the company got the most of it. The smartphone will launch on Android 4.4 KitKat, which is what also powers powers our test unit, so we do expect a small boost later down the road when the Lollipop update arrives. Currently, we have two all-round test available – GeekBench 3 and Basemark OS 2.0. It both scoreboards, the Oppo R7 sits comfortably, where you would expect to see a Snapdragon 615 device. Interestingly enough, in both instanced the phone is outperformed by the Galaxy A7, which runs on the exact same chipset. This could be a matter of optimization, but, there is also the matter of price and the A7 tends to be a little bit costlier. The Galaxy Alpha, however has a pretty similar price tag. Next up, we have the graphic intensive GFX. The Oppo R7 is equipped with an Adreno 405, it is by no means a powerhouse, but still gets the job done. Performance, once again, is just as we expected. Onscreen and offscreen performance are pretty comparable, due to the 1080p screen resolution and both are near the bottom of our list. The older T-Rex test churns out about 15 frames and the newer Manhattan, almost 6 fps. This is more than enough for casual games but some heavier titles might not run as smoothly as possible. 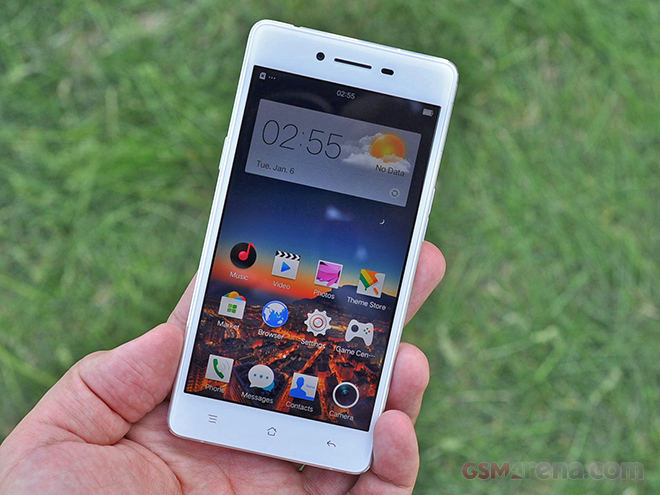 Don’t forget to check out the rest of our Oppo R7 and R7 Plus hands-on here.